The fourth in its series of Teenie Harris exhibits, the Carnegie Museum of Art in Pittsburg will exhibit Teenie Harris Photographs: Cars from April 30 to Nov. 16. Charles 'Teenie' Harris. 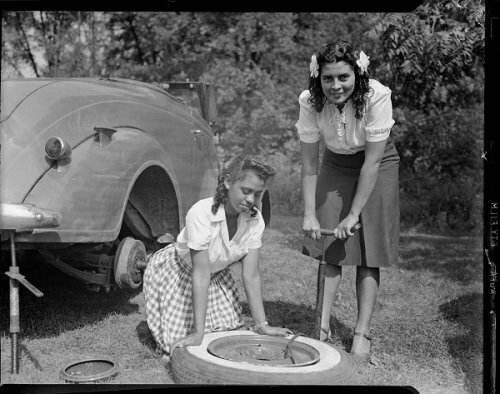 Two young women inflating car tire tube with hand pump, c. 1940-1945. The exhibit will showcase 25 of Harris' images from the Teenie Harris Archive, which includes over 2,000 images of Cadillacs, Chryslers, Dusenbergs, Hudsons and Buicks, among others, from the 1930s to the 1970s. Celebrities like Willie Mays, Nat King Cole and Billy Eckstine also make an appearance. Charles 'Teenie' Harris. Bandleader and musician Billy Eckstine posing with Cadillac convertible, on street in residential neighborhood, June 1947. Harris photographed the daily life of African Americans for the Pittsburgh Courier, among the nation's most influential black newspapers, as one of the paper's principal photographers from the 1930s to 1970s. The Csrnegie exhibits are drawn from the over 80,000 negatives and 560 silver gelatin silver prints in the archive, some 60,000 of which the Carnegie has digitized for online display. The exhibit will also feature "never-before-shown, recently-digitized 16mm film footage from the Archive depicting the Harris and his family with their cars," the Carnegie noted. The archive contains over 5,000 feet of 16mm film, which includes original Harris footage spliced with commercial newsreel and cartoon footage from the 1940s. Teenie Harris Photographs: Cars is organized by Kenneth L. Hawthorne, who once serviced cars for Teenie and his brother Woogie Harris. Hawthorne, an Esso station owner, became vice president of Gulf Oil in Pittsburgh. PITTSBURG -- Charles "Teenie" Harris photographed several decades of life in Pittsburgh's Hill District and was known for his love of beautiful women, big dogs and big cars. Teenie Harris Photographs: Cars presents 25 selections from Carnegie Museum of Art's Teenie Harris Archive, which contains well over 2,000 images of automobiles from the 1930s to 1970s. The exhibition emphasizes not only the beauty and elegance of these iconic cars -- Cadillacs, Dusenbergs, Hudsons and Buicks -- but also the roles that they played in Pittsburgh's segregated African American communities. 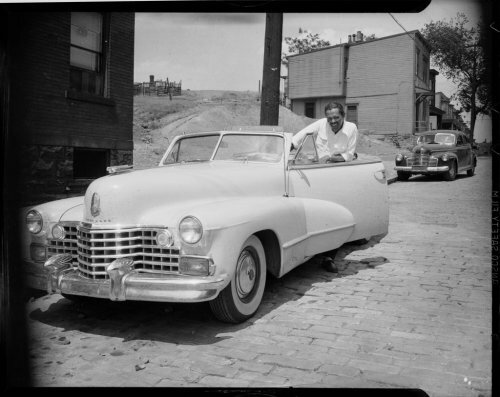 Harris photographed the micro economy of the Hill District's repair shops, service stations and dealerships, as well as black celebrities interacting with cars, such as Willie Mays representing Buick or Nat King Cole riding in a black-owned Owl Cab when other Pittsburgh taxi services refused black riders. Harris captured them on showroom floors, in driveways, on the street and at parties, always as part of daily life. Also on view, never-before-shown, recently-digitized 16mm film footage from the Archive depicting the Harris and his family with their cars. The video is paired with oral histories by Harris's children, Lionel Harris, Crystal Harris Pass and Cheryl Harris Watson, recalling their childhood experiences with a car-loving dad. Teenie Harris Photographs: Cars is organized by Kenneth L. Hawthorne (b. 1934), who once serviced cars for Teenie and his brother Woogie Harris. Teenie followed Hawthorne's automotive career from Esso station owner to a vice president of Gulf Oil in Pittsburgh. This is the fourth in a series of small exhibitions drawn from the Teenie Harris Archive on view in the museum's Lobby Gallery.